Heather McLeland-Weiser, CG, Librarian at the Seattle Public Library, presented a project to the PS-APG group at our December 2006 meeting. She had come into the possession of a Scrapbook. The Scrapbook was found resting on a shelf in the Art Department of the Seattle Public Library. Its origins were a mystery. After a preliminary examination, it became apparent that someone had taken an accounting book for a shipping business and repurposed it as a scrapbook. It was discovered that the ledger entries were dated about 1854 and references were made to ships’ names and ports. Upon further examination of the ledger pages, it was found that goods were being transported throughout the Great Lakes region. About 20 years later, circa 1875, someone had turned the accounting book into a scrapbook and added advertising cards. These advertising cards are very colorful and have many different themes. The majority of advertising cards were carefully removed to reveal the ledger pages beneath. The accounting book/scrapbook came into the possession of the Seattle Public Library about 1922. 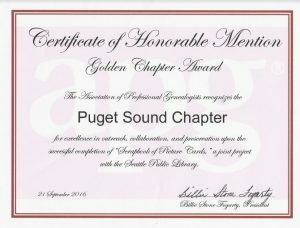 The goal of PS-APG was to determine who had submitted the Scrapbook/Ledger to the Seattle Public Library and why! Evelyn Roehl, Scrapbook Project Coordinator, and several members of PS-APG completed the research project. 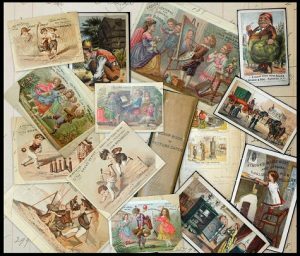 Seattle Public Library’s ‘Scrap Book of Picture Cards’: A Journey From the Great Lakes to the Great Northwest.